A couple months ago when I was at Costco, and had just recently read a sobering article about the living conditions of dairy cows, I picked up a case of almond milk. I didn't really like that there were more ingredients than almonds, water, and MAYBE a bit of flavor (vanilla, sugar, whatever). So right there in the aisle, I googled "How to make almond milk" and I was BLOWN AWAY at how simple the process is. Anyone can do it! 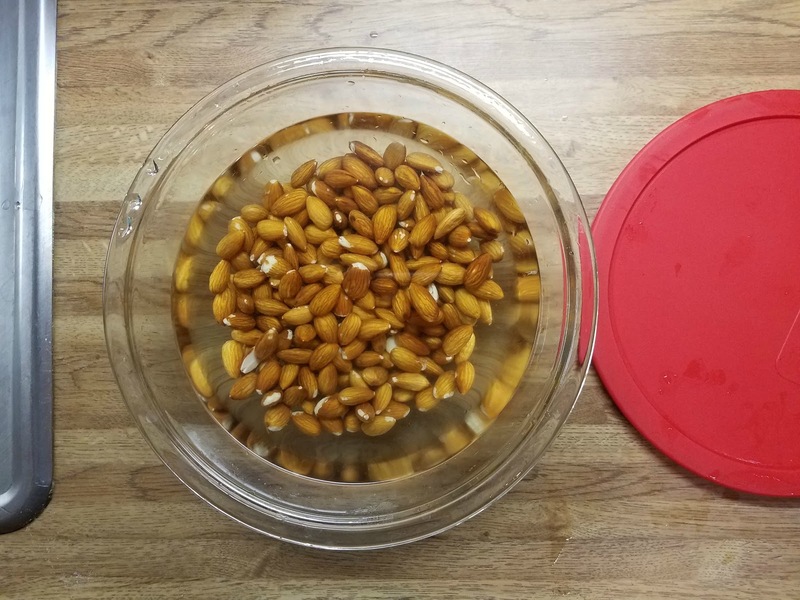 First, you soak the almonds overnight in a bowl. You'll have the best tasting almond milk if you change the water a couple times. I usually let them soak for about 24 hours. Two tips I have learned from countless Google sessions: Costco really does have the best prices (3lbs for $12-13), and you can also blanch the almonds instead of soaking. Personally, I liked to just dump 2c in a bowl and walk away. After you soak, you can leave the skins on, or you can peel them. If you leave the skins on, after you strain it, you'll have almond meal from the pulp. If you peel them, you get almond flour. 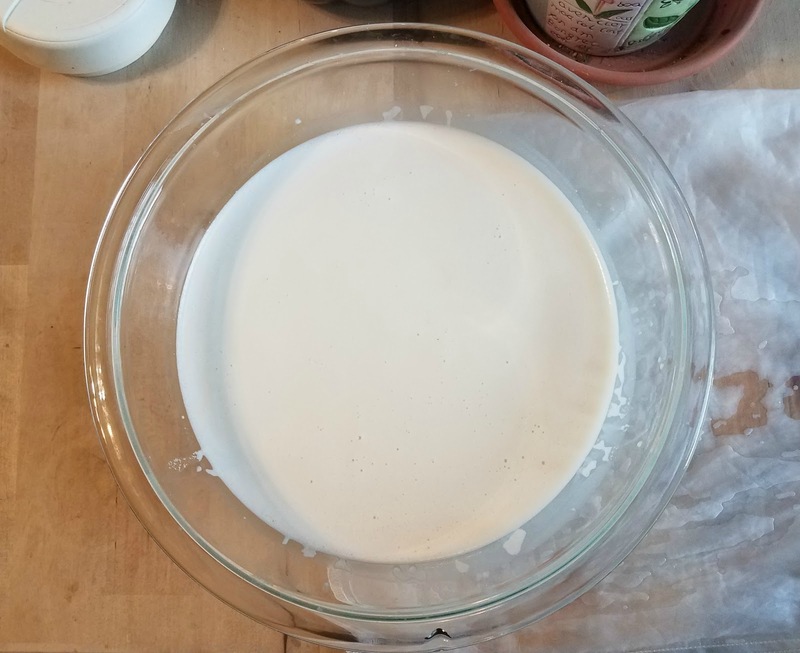 I have tried it both ways, and in my opinion the milk tastes better when you peel them, it's much easier to strain, and almond flour is more useful than meal in my kitchen. Peeling sounds tedious, but once you have soaked the nuts, it's very easy to pinch the almonds right out of the skin. Takes me no more than 15 min to pinch 2c of almonds... if I am not trying to play Kingdoms on my phone at the same time. Once you have peeled the nuts (or not), just put them in the blender. 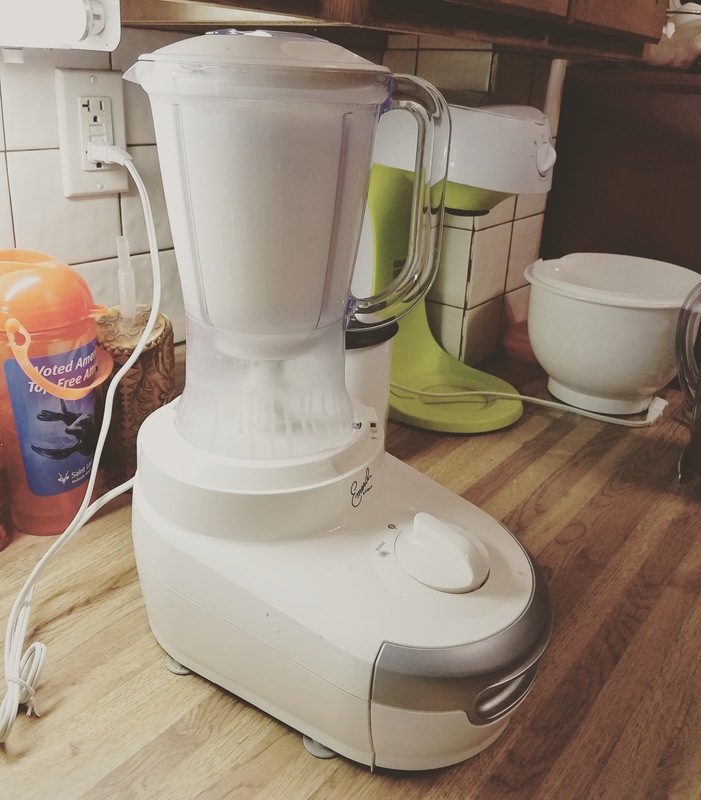 With 2 cups of nuts (pre-soaked), I fill my blender up to the top line. I was drinking whole milk before I switched, so your taste may vary. Pulse a couple times and then let it run for a couple minutes. Sidenote: This old Emeril 3-in-1 BAM food processor/blender/juicer that has served me well for more than a decade but is probably on it's way out. I need recommendations for space saving multi-use appliances! My third tip: for the love, buy a nut milk bag (affiliate link). You may not even make almond milk twice if you try to use cheesecloth instead, ESPECIALLY if you don't peel the nuts. The Ellie's Best one I linked to truly is worth every penny. 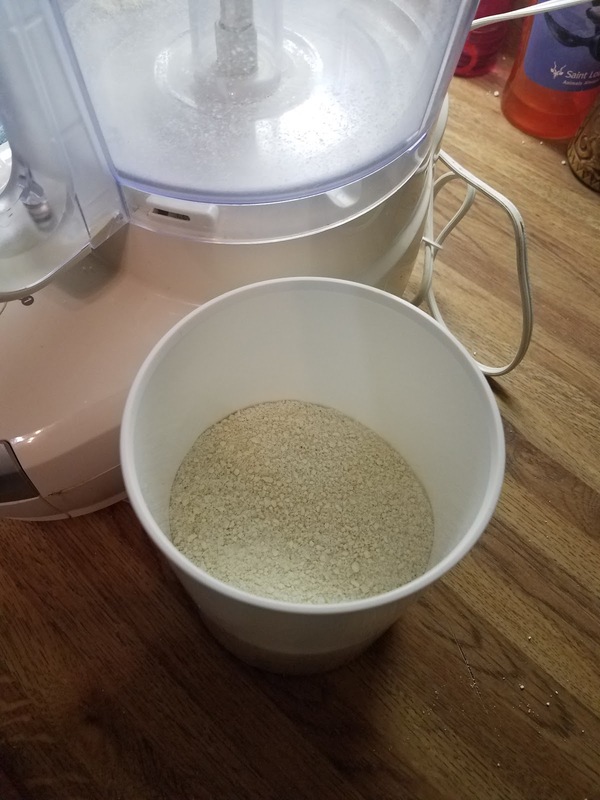 Here's where you start channeling your inner Caroline Ingalls: What is left over in the bag after you've squeezed out all the milk is NUT PULP and all you have to do is dry it in the oven and send it through the food processor (coffee mill?) for a couple minutes to have almond meal/almond flour. As I mentioned earlier, I prefer the texture of almond flour. I just spread it out on a cookie sheet in a 200 degree oven for 2 hours (I stir it up - carefully - halfway through) and when it's done I just buzz it through the food processor long enough to break up any big chunks. 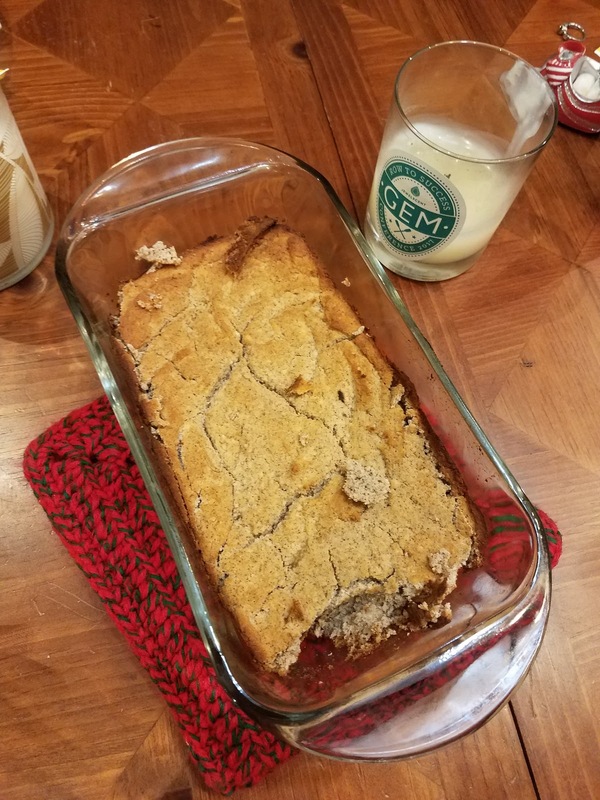 And here's where you go next level: try to find an almond flour banana bread recipe (to use up those 3 black bananas we have every week) that ISN'T full of insane paleo/keto/gluten free ingredients you don't have on hand. Look y'all: I just want to avoid food waste. Let's not get crazy. Lucky for you, I managed to find one, which IS paleo but is NOT full of crazy ingredients, and it makes a delicious loaf of bread. So delicious, in fact, that Stella (our Great Pyranees/Border Collie puppy) ate the whole first loaf I made, and let me tell you how many tears I shed over how all my pioneering skills had been wasted on this stinkin' dog. The recipe is super easy, though, and a few days later I had enough almond flour for another loaf. The whole family gave the second attempt two thumbs up!